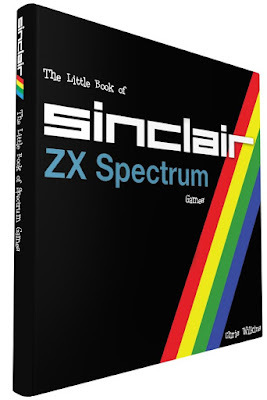 I was starting to wonder when the next popular book from Chris Wilkins would appear and sure enough here we are announcing the next one in his retrotastic library, ' The Little Book of ZX Spectrum Games '. From the creator of 'The story of the Sinclair ZX Spectrum in pixels ' Vol 1 - 3, ' The story of the Commodore 64 in pixels ' , ' The History of Ocean Software ' and other such fine nostalgic look backs, this one is going to be a pocket size book that will feature over 150 games with a single page being given to each game! In fact according to Chris, this book will be a hardback, high quality glossy paper and is 15.2cm x 15.2cm in size - ideal for jacket pocket or backpack. Furthermore when it comes to the games, each one will have its own page with inclusive review, score - split into a multitude of genres such as Sports, Arcade, Adventure, Adventure, Simulation and finally each section will be split as below with art from Crash magazine!